Shopping for Horror: Childs Play Action Figures? Don't look now, folks, but Chucky's back! The demonic doll from the horror movie Child's Play. Mega-scale action figure stands 15-inches tall. Features 11 points of articulation, real cloth Good Guys clothing, and a knife. "We're friends to the end!" 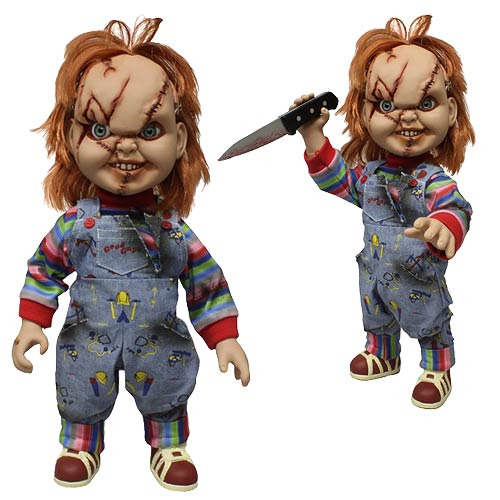 You've got a creepy, not-so-little friend for life in this Child's Play Chucky 15-Inch Mega-Scale Action Figure. Featuring 11 points of articulation, Chucky includes real cloth Good Guys clothing, his trademark orange hair, realistic glass-like eyes, and a knife that he's sure to use for no good! Packaged in a collector-friendly Good Guys Doll-styled window box, the 15-inch tall Child's Play Chucky Mega-Scale Action Figure makes a terrific gift for fans of the Lakeshore Strangler… or an obligatory present for someone you really don't like. Ages 15 and up.